Considering the inventor of the flushable toilet, Albert Giblin (credit is often, wrongfully, bestowed upon Sir Thomas Crapper), was himself a Brit, there is little excuse for primitive nature of British loos. At first, I thought I was just having bad luck, but after comparing notes with a fellow traveler, and discovering that she had encountered the same problems, we had a lengthy discussion about our experiences and came to the following conclusion: it takes at least three flushes to do the job. Holding the handle down longer doesn’t help and, in fact, can exacerbate the problem. I spent 20 minutes some days just trying to make sure that the loo was fully flushed for the next person. Apparently, poorly functioning toilets are so widespread throughout the country that everyone just incorporates it into their day, like breathing. Near the end of my trip, I asked a friend who is a native Brit if he’d ever noticed problems flushing the toilets. He just shrugged. He didn’t seem to care. I wondered if his casual attitude was because he’d never experienced a properly functioning toilet? My advice: let the toilet water run full cycle before trying again, and if you are in a big hurry, try to sneak out of the bathroom before anyone figures out which stall you used. The one bright spot I found during my toilet toiling was that Brits do have a sense of humor, however subtle and twisted. They annually acknowledge the “Loo of the Year” (see http://freespace.virgin.net/martin.higham/). I expect there is a long checklist of qualifications used to determine which public facility deserves such an honor, however, flushability is the obvious exemption. I know this because I used the bathroom at Castle Howard (outside of York, in North England) recipient of “2001 Loo of the Year” award. While the bathroom was attractive, with wood paneled stalls and Corian-style wash basins, I ranked it in my top three most troublesome flushing experiences (and make no mistake, that was not due to my contributions). While the toilets were troublesome, they were at times amusing. What I found distinctly less amusing was what the people of Britain accept as a sorry excuse for a shower. I never did get confirmation on this, but I decided that British people must take a lot of baths because, aside from in the newer buildings (and even sometimes in those), every place I stayed had a bathtub with a makeshift shower. By makeshift I mean, instead of a sturdy chrome shower head poking through a wall of tile, as you might expect in many other first-world countries, a bather is instead faced with a hose-like contraption bracketed up the wall above the tub faucet and topped with a small plastic showerhead, all resembling a slightly larger version of one of those flexi-hose nozzles used to help rinse dishes in the kitchen sink. It was as if someone had traveled to America, been impressed by our quick and convenient method of bathing, and rushed home to the mother land to jerry rig a similar contraption from a piece of garden hose and a small sprinkler head. And after it was done once, the idea took off like wildfire across the country, with every copy cat using the same cheap parts. Another interesting feature is that no shower in the U.K. operates by simply turning on the water–that would be too easy. Every single shower I used had a trick to it. You have to find the pull-cord or the red switch or knob, or all three, before you could get the eventual trickle of water to leak out. I strongly advise travelers to ask your host how the shower works before you are left alone in the bathroom to fend for yourself. Water pressure problems are the main source of the flushing and showering struggles. 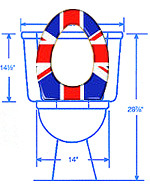 Most British homes have only a 1/2-inch supply line to the water main (compared to the much larger standard American pipes), which will not provide enough water for simultaneous use of sinks, showers, and/or toilets. To get around this problem, many homes have installed a cistern in the attic that depends on gravity to distribute water through the rest of the house. This sometimes forces a homeowner to install a pump or heater/pump in places like the shower (hence the switches, knobs, and pull-cords mentioned above) just to have somewhat adequate water pressure. As it is, the materials used in shower construction are designed for low-pressure flow. My personal theory (and this has not been confirmed) is that the plumbing in much of Britain was installed in the wake of the devastation caused by World War II, and has yet to undergo any major renovation since then. And because the Brits seem perfectly content to live with their showers and loos as is, we tourists who are used to a little something more must simply get used to it too. But if you’re like me and love to travel, but always end up writing “Things I Miss from Home” lists, you can be sure that your bathroom, will be at the tops of that list, and it will forever after hold a special place in your heart.